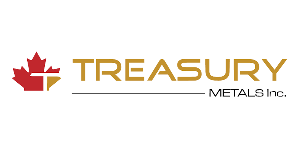 Treasury Metals Inc. ist ein Unternehmen, das sich auf die Exploration und Erschließung von Goldprojekten in Ontario, Kanada, spezialisiert hat und dessen Aktien an der Toronto Stock Exchange unter dem Kürzel TML (TSX: TML) gehandelt werden. Das Goldprojekt Goliath im Nordwesten der Provinz Ontario, an dem Treasury Metals Inc. sämtliche Beteiligungsrechte besitzt, ist auf bestem Weg, einer der nächsten Goldproduktionsbetriebe Kanadas zu werden. Nachdem bereits eine erstklassige Infrastruktur vorhanden ist und sich die Goldvererzung bis an die Oberfläche ausdehnt, will Treasury Metals im Rahmen der ersten Erschließungsphase einen Tagebaubetrieb zur Förderung von Erz für die Beschickung einer Verarbeitungsanlage mit einer Durchsatzleistung von 2.500 Tonnen pro Tag errichten. In einer späteren Phase des Bergbaubetriebs soll dann der Abbau unter Tage erfolgen. Mr. Ferron is a senior executive who brings more than 20 years of capital markets experience including corporate finance, corporate development and investor relations within the finance, energy and mining sector. Mr. Ferron has been instrumental in Treasury Metals Inc.'s transition to a development stage company and involved with raising capital for company mineral project development. Prior to joining, Mr. Ferron held various positions, including as a member of the stock list committee and heading the Global Business Development for the mining sector, at the Toronto Stock Exchange and the TSX Venture Exchange. Prior to that, Mr. Ferron was an Analyst at Scotiabank. Mr. Ferron holds a Bachelor of Commerce from the University of Guelph. He is also Vice President of Laramide Resources Ltd.
Dennis Gibson has been the Chief Financial Officer of Treasury Metals Inc. since 2010. Mr. Gibson is also the Chief Financial Officer of Laramide Resources Ltd. Mr. Gibson has held various senior financial positions for the past 30 years. He is the former Chief Financial Officer of Aquiline Resources Ltd. (2006-2009), which was acquired by Pan American Silver Corp. and Forrester Metals Inc., which was acquired by Zinc One Inc. Mr. Gibson is a CPA, CGA and holds a Bachelor of Commerce from Concordia University. Mr. MacDonald is a registered Professional Engineer in Ontario and holds a Bachelor of Science, Mining Engineering, from Queen's University. He has more than 30 years of experience in the sector at several Canadian mining operations, including Goldcorp's Musselwhite and Red Lake Gold Mines and Kirkland Lake Gold's Macassa Complex gold mine in Ontario. In addition, he worked with Cameco Corporation at its Cigar Lake and McArthur River's uranium projects in Saskatchewan. Mr. Wheeler, a Professional Mining Engineer, joins Treasury Metals from Teck Resources Limited's Quebrada Blanca open-pit mine where he held a number of roles with increasingly greater responsibility, most recently as projects engineer. His experience also covered large-scale gold projects including the Willams underground mine, located in Ontario, Canada, where he was underground production supervisor. Mr. Wheeler has a mining engineering degree from Queen's University in Canada.